Encourages readers to release, receive, and fulfill the calling and destiny God has prepared for them. 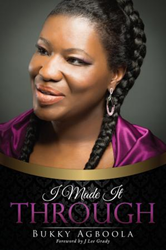 In Bukky Agboola’s new book, I Made It Through ($15.49, paperback, 9781498472142; $7.99, eBook, 9781498472159) readers will be blessed and inspired by the triumph of faith in God through Jesus Christ. Journey with Bukky from Nigeria, to California. When God’s word is believed, trusted in, and obeyed, the human spirit can endure and come through a myriad of trials. Readers will learn faith principles that have turned many lives around in this moving account. Bukky Agboola has been blessed to be an ordained Minister of the Gospel of our Lord Jesus Christ for over two decades, and released four gospel albums, two of which were sold out during her tours all over Nigeria and the United Kingdom. A graduate of one of Africa's top Universities, The University of Ife, now known as Obafemi Awolowo University, in Ile Ife, Oyo state, Nigeria and Award winner at the Coulsdon and Purley Music Festival in England. Xulon Press, a division of Salem Media Group, is the world’s largest Christian self-publisher, with more than 12,000 titles published to date. Retailers may order I Made it Through through Ingram Book Company and/or Spring Arbor Book Distributors. The book is available online through xulonpress.com/bookstore, amazon.com, and barnesandnoble.com.